A pair of Earrings selected specially for your order. 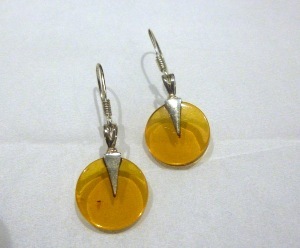 Amber Earrings on Silver Mount. Amber is fossilised tree resin, which has been appreciated for its color and natural beauty since Neolithic times. There are five classes of amber, defined on the basis of their chemical constituents. Because it originates as a soft, sticky tree resin, amber sometimes contains animal and plant material as inclusions. Strictly speaking, Amber is not a crystal at all but is said to be powerful chakra cleanser and healer. At a physical level, it may imbues the body with vitality and may have the power to draw disease out of the body. By absorbing pain and negative energy. It may also alleviates stress, resonates with the throat, treating goiters and other throat problems. Treat stomach, spleen, kidney, bladder, liver, gallbladder and alleviates joint problems. Amber can be found in many places including such as Britain, Poland, Italy, Romania, Russia, Germany, Myanmar, Dominica.